We specialise in same day two hour delivery in London, available Monday to Saturday between 9:00 and 21:00. Order at least 6 bottles or spend more than £200 and standard delivery is free. Cases can be mixed. We can gift wrap in a choice of five pearlised colours and personalise with a handwritten message. If you send gifts on behalf of your company or to individuals within your company, we offer a corporate gifting service. If you would like to collect your champagne, you can do so from Angel Flowers in Islington. We frequently organize tasting events for private clients and companies of all sizes. The most important factor to consider when storing wine is a constant temperature ideally around 12°C. If you are planning an event and need more than 24 bottles of champagne we can quote you special pricing terms. We may be interested in purchasing champagne that has been professionally stored. 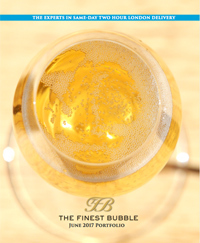 Our portfolio gives an overview of the Champagne brands along with many interesting articles.